At 7:00am on a lazy Sunday morning, most college students on their last week of winter break were tranquilly snoozing in their comfy beds, with every intention of remaining so into the late morning. The members of MAB Baton Rouge 2, however, were in a strikingly different scenario. They awoke bright and early in sleeping bags on a carpeted floor. They quickly scarfed down a meager breakfast, packed a sandwich and chips in a brown paper sack for lunch, scurried out the door, then promptly ran back upon realizing they had left a member behind. Finally, they departed and were on their way to the St. Bernard Project office in Baton Rouge for their first day in a week of service! Casey—their volunteer coordinator—gave a brief overview of the flooding in SOLA (AKA Southern Louisiana) and a history of the St. Bernard Project. Zack Rosenburg and Liz McCartney were trying to volunteer after Hurricane Katrina, and the only group that responded asking for their assistance was St. Bernard Parish in New Orleans. Zack and Liz discovered that there was a much faster and more economical way to get displaced people back into their homes, without completely gutting the original structure. Thus, the St. Bernard project was born. It utilizes a vertically integrated system in which homeowners can circumvent contractors; the project provides every step of the renovation. Since its founding in 2006, the St. Bernard project has rebuilt more than 1,170 homes. The members of MAB Baton Rouge 2 were given their site address for the day and journeyed to Village Green Drive. Upon their arrival, they were greeted by Candice, the site manager, and got to work. Attired in thick work gloves and face masks, they began sanding down the plastered walls of the entire house to prepare for priming. White particulate matter filled the air and accumulated on the ground as they worked. 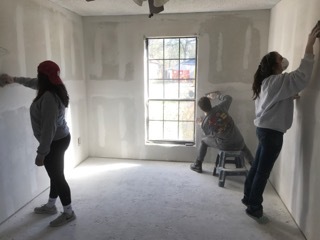 When Candice deemed their work satisfactory, they began spackling in the corners (apparently also known as "mudding" and "paint tape"). After a full day of work, the members of MAB Baton Rouge 2 returned to their adopted home and spent probably a few too many hours playing games and chatting before happily dozing off in their respective sleeping bags. It was a chaotic morning. Somehow, the group managed to depart with all twelve members and all twelve packed lunches, albeit a little late. Their site for the day was a modest yellow home on Plaza Drive where they were introduced to Leah, the site manager, and Shirley, the extremely welcoming homeowner. Leah started off with an icebreaker in which members had to share fun facts, some of which included not being flexible, meeting Liam Hemsworth in an airport, and accidentally setting one's own pants on fire. 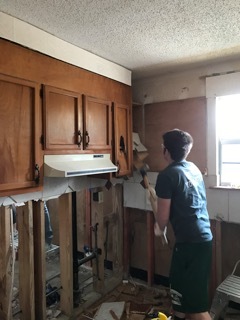 The members of MAB Baton Rouge 2 were tasked with removing the drywall from several areas of the house as well as the kitchen cabinets. The next few hours flew by as each member dutifully performed his or her task and sporadically chatted with Shirley. She told them she only had time to grab her marriage certificate, a few photographs, and a purse when the she was forced to evacuate due to the flooding in August. Shirley also mentioned that she was a local Kindergarten teacher, and had been living in her current home for 19 years. She had just remodeled her bathroom and laid down new tile six days before the flooding hit her home. It was a very satisfying day of work for the MAB team. At the end of the day, they had made noticeable progress in Shirley's home and were in high spirits, although deservedly exhausted. After quelling their ravenous hunger, the group sat down for reflection. Each member shared what impacted them over the first two days of service. The general consensus was shock at how long it took to renovate and repair people's homes as well as the realization that it's not so easy for people to simply leave every time a natural disaster occurs. As one especially reflective member noted, "It's a lot easier to sympathize with people when bad things happen, but after this experience you're better able to empathize with them." They also shared which MAB principles they had noticed among the group. The most popular answer was "poco a poco" (translated: little by little). Completely renovating a damaged home takes time and progress is made slowly, even with a team of twelve.